If you follow the simple, practical advice contained in this e-book, you could see your hypoglycemia symptoms disappear in just a few days. Many people are feeling much better within two weeks, and it’s possible to remain symptom-free (as long as you stick to the diet). I have been free from hypoglycemia for almost 40 years. This e-book is based on my own experience and research. 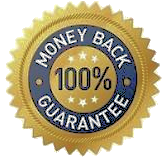 I’m so confident my advice will work for you, I’m offering a 90-day money-back guarantee. I know how you feel because I’ve been there myself. Thankfully, I have been able to completely heal my hypoglycemia by making some simple changes to my diet, which I explain in this e-book. I promise you’ll find in this 32-page e-book some of the most powerful information available anywhere about hypoglycemia – about what to eat and more importantly, how to eat, so you will eventually overcome hypoglycemia for good! This e-book doesn’t contain the usual rehashed theories you’ve probably read before. I’ve written it especially for people who have already tried what their doctors or other experts have recommended and have not really made any great improvement. In fact, I believe the typical diets recommended for hypoglycemia will not help you get permanently well. They’ll just drive you crazy trying to follow them! 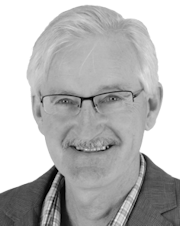 I was first diagnosed with hypoglycemia in 1978… when I was 22 years old. I actually had chronic fatigue syndrome for several years but that wasn’t diagnosed until much later. Fortunately, I came across a wise old doctor who tested me for hypoglycemia with a full 6-hour glucose tolerance test. He confirmed I had hypoglycemia. The problem was, this doctor didn’t really know much about the best diet to eat. I remember he told me to “eat some cold potato before bedtime.” He never mentioned about not eating sugar! So I had to study about hypoglycemia myself. I read everything I could get my hands on, over several years. And I experimented with all kinds of diets – from high-protein Atkins-type diets to high-carbohydrate, low-fat diets – and all kinds of other diets such as food combining, macrobiotic, Ayurvedic etc. 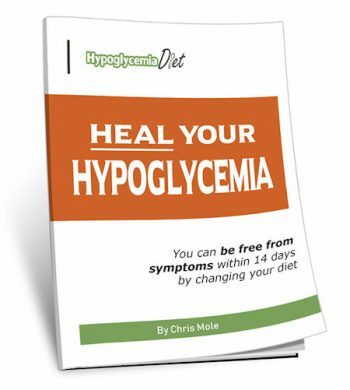 This e-book explains what I have learned about hypoglycemia and diet. I believe it’s the most commonsense approach you’ll read anywhere. And above all, it really works. High protein diets. Low carb diets. Low fat diets. Eat only protein and vegetables. Food combining. Eat six small meals a day. Look at the glycemic index (GI) of everything you eat. It’s a nightmare when you first start out. So many theories, it makes your head spin. Thankfully, I’ve been through all that and come out the other side. Although this e-book is relatively short (33 pages) it’s packed full of information. There’s no fluff just to fill the space. Nor do I go into detailed medical and scientific explanations of what hypoglycemia is. This e-book has only one purpose – to help you get well. Pure and simple. It’s not just theory dreamed up by researchers in a laboratory. As I said earlier, it is based on what I have actually tried and proven in my own life over the last 35+ years. There’s a reason why I disagree with a lot of the typical dietary advice given to people with hypoglycemia. It’s because I have personally tested all kinds of different diets and theories. I’m going to recommend only what I have proven to work for me in the real world. In many cases, I have followed the advice of “experts” and found it didn’t work for me. In fact, as I’ve talked with other people with hypoglycemia, I’ve found a lot of the mainstream advice didn’t really work for them either. Many of the diets recommended for hypoglycemia are just too difficult to follow on a long term basis. They ask you to eat foods you’ve never heard of before. They recommend eating 6 to 8 times a day, even when you’re not hungry. And above all, many of the diets recommended for hypoglycemia are just plain wrong. They don’t make you feel any better and they don’t work to rebuild your overall health so that eventually you can be completely healed from hypoglycemia. “I read your e-book today and I think God may have answered my prayers. I have been suffering with this problem on and off for 20 years. I have tried everything… low fat, high fat, no carbs was the worst one. I have given up milk, wheat, rice, coffee, tea, shrimp, beef… you name it and at one time I have given it up. Nothing worked! That doesn’t mean you can go back to eating the wrong kind of diet that helped to cause your hypoglycemia in the first place. But it does mean, if you eat sensibly for the rest of your life, you can enjoy a full and healthy life without any hypoglycemia symptoms. That’s what you’ll discover in this e-book. I promise you’ll get the straight facts about what has worked for me and restored my health from the nightmare of hypoglycemia. And I don’t have to live on an impossible diet like some so-called experts tell you. You’ll be pleasantly surprised to learn that having hypoglycemia is not a life sentence to a boring high protein, low carb diet! This e-book is only $9.95. I’ve priced it so everyone can afford it. I recommend you buy it, read it and apply it. And watch the improvement that will occur in your health! If you seriously follow the advice in this e-book, I am confident you will see a huge improvement in your health. But if for any reason you follow my advice and don’t see any real change in your symptoms, then I’m happy to refund your $9.95 in full. Just email me and let me know your experience with the diet. As long as you get back to me within 90 days and have genuinely tried to follow the diet, you can have your money back. So you have nothing to lose and everything to gain by purchasing this e-book.